Small Towns, Big Stories showcases twenty-one stories of small-town life by the country’s greatest living chronicler of the Indian heartland. 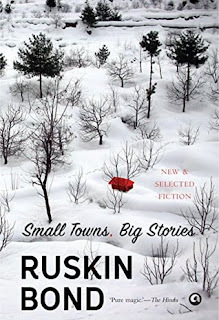 Ruskin Bond has been writing evocative stories about the dusty towns and settlements in the hinterland for decades but this is the first time his finest stories on the theme have been brought together in a single volume. Timeless classics like ‘Time Stops at Shamli’, ‘Bus Stop, Pipalnagar’, and ‘The Night Train at Deoli’ rub shoulders with brilliant new stories that have never been published before like ‘Strychnine in the Cognac’, ‘The Horseshoe’ and ‘When the Clock Strikes Thirteen’. Vibrant, poignant, beautiful and tragic, these stories show a master storyteller at the height of his powers. This being my first book for 2017 it had to be a special read, one that would leave me with a pleased feeling at the end of it despite the nature of the stories. And who other than the master story teller to my rescue!Ruskin Bond tops the list of my must-read authors, not only as readers but also as writers. His simplicity both in story telling and language are something we all can learn from. Apart from that his love for life, which as per what I have heard is pretty infectious. This book needless to add is yet another masterpiece from the maestro. Though a collection of some of his previously published stories, these stories have the theme of small cities binding them very beautifully. Though each and every story is exceptionally well narrated, bringing to life the beauty of the wilderness and the mountains what is most amazing amongst the stories is the way the author himself plays a role in each one of them. They begin to sound more biographical in nature due to this and hence make you feel as if you are listening to a friend sharing his life story with you. Well, if that makes him my friend I would be more than happy! 21 stories full of snow, mountains, greenery and the peace that co-exists with life in small towns acted like a warm hug from a loved one as I battled flu. It was the perfect antidote to my fever for it was like a walk down the memory lane, nostalgic and one that made me shed tears of joy at the same time. His writing is something that can be easily called as one that is straight from the heart because of which it is touching with its honesty. It is very difficult to choose favourites out of these gems yet if there are ones that I loved a little more than the others then it would be "Time stops at Shamli", "The funeral", "When the clock strikes thirteen", "The night train at Deoli", "Strychnine in the Cognac", "Of Rivers and Pilgrims", ah! I could keep going on. The fragility of human relationships displayed so well along with the non-predictability of life. The contrasting nature of these two make for a wonderful read, one that not only demystifies things for you but also one that leaves you with lot of questions on life. Strongly recommended, to each and every book lover- this one is something that should be read to know the truth behind the old adage "Life is beautiful!" This book is like Banarasi Dum Aloo - flavourful, colourful, delicious and fragrant long after you are done eating! Ah! Ruskin Bond is the master story teller :) I am sure you will love this one. The other blog Memoirs of Me is no longer existent. All good, hope the same with you. You too take care. Thanks for stopping by!